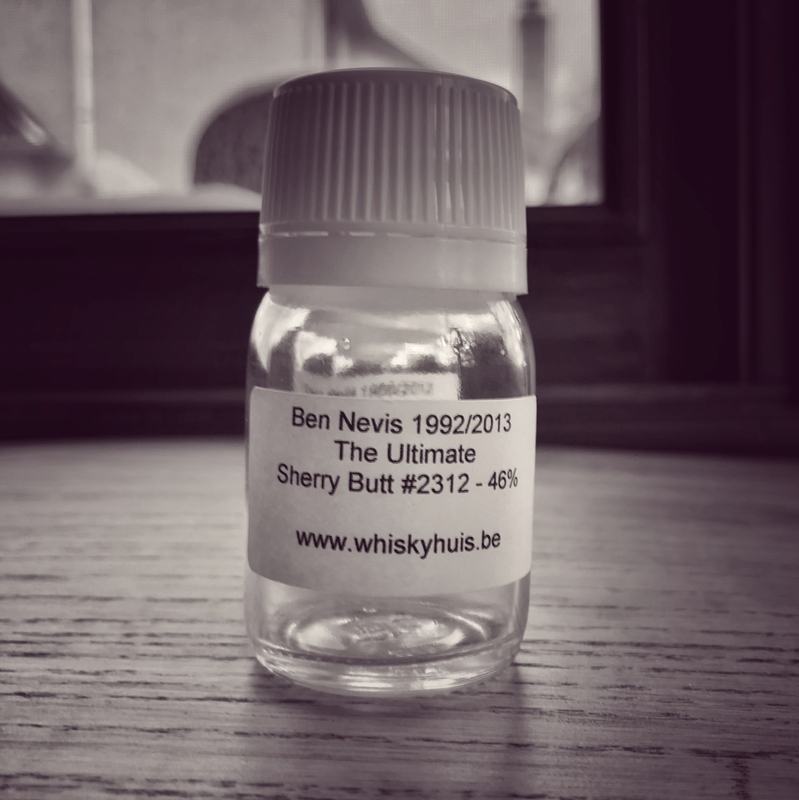 The Signatory warehouses are lousy with 1991-1992 sherry butts full of Ben Nevis. They've released 43 of those casks, so far. But they don't seem to be much into sharing them with van Wees, the Dutch importer who bottles their The Ultimate series from Signatory casks (allegedly). van Wees has released 0 1991 Ben Nevii, and 2 1992 Ben Nevii. Having a sample of the older of the two makes me a happy man. Time to drink it. Oh yeah, that's the stuff. Old funky musty cask basement warehouse on the nose. Macintosh apples floating in smoked lemon juice. Dates stuffed with dried herbs and cinnamon candy. The palate begins with tart fruits, honey and almond butter. Dark chocolate, figs and weed. Tangy citrus, herb (take that as you may) and a pinch of sugar in the figgy finish. The nose becomes more herbal. And now there's asphalt, brine, dingy smoke, limes and cinnamon. The palate is more herbal too, somehow. Bitterer and mustier basementer. Nuts and tart citrus. It finishes tangy and tart. Almonds, vanilla and herbal bitterness. Thicc thick. 💚 it. I don't know how a 1990s single malt can be made to taste like a 1960s blend infused with figs, lemons and marijuana smoke, but it happened here. Nooooo complaints, other than I had but only a sample of this. The whiskybase crowd is much less excited about this than I. Oh well. It can't be said that Ben Nevis is always (or ever) like this particular creation, but I do fancy this distillery. Availability - Possibly a few retailers in Europe? Quite a shame that the one member of the WhiskyBase community with a bottle to sell (at a very reasonable price!) doesn't ship outside of Germany. C'est la vie and all that. Yeah, I saw that too. I hope someone buys it and enjoys it in Germany. Damn it.